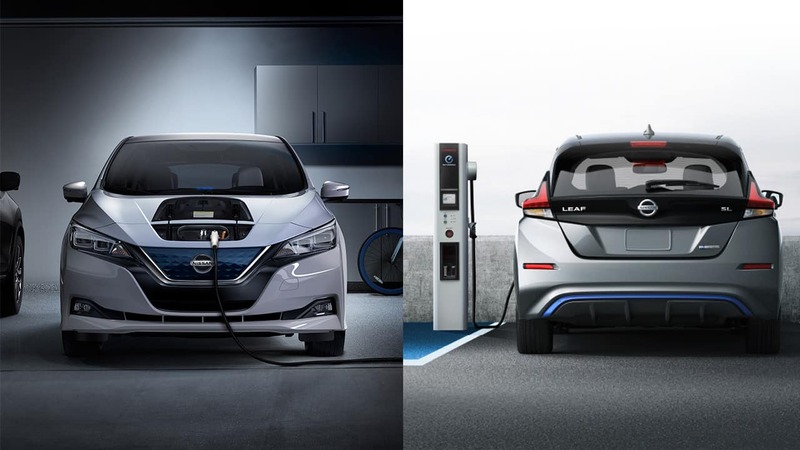 The 2018 Nissan Leaf is so much more than an EV–its a true leader in the automotive industry, leading the industry into a better automotive future. The 2018 Leaf has an impressive 150 mile range. This longer range comes with an MSRP that’s lower than ever before. The 2018 Nissan Leaf starts at a low price, which makes its MSRP several hundred dollars lower than the top competitors in it’s class. It also has lower maintenance costs than traditional internal combustion vehicles, which saves you even more money. Its 40% range increase (the 2017 Leaf’s range was just 107 miles) is due to a larger capacity 40kWh battery. Additionally, according to Nissan, 90% of the Leaf’s batter can be retained for 60,000 miles. The battery comes with a standard 8 year/100K mile warranty and a 6.6kW onboard charger. The all-new 2018 Leaf comes with all new exterior and interior styling. It features sharp lines and improved aerodynamics to improve range efficiency while also keeping the car stable in crosswinds. The exterior was designed with a Nissan V-motion grille, boomerang tail lamps and a floating roof. The new interior is clean and modern and includes the Nissan Gliding Wing form instrument panel. Nissan’s engineers designed a new engine for the 2018 Leaf. The 110kW motor gives the new Leaf stronger acceleration. The acceleration is also made more responsive by the all-new e-powertrain. The Leaf also has 37% more horsepower and 26% more torque than the 2017 model. 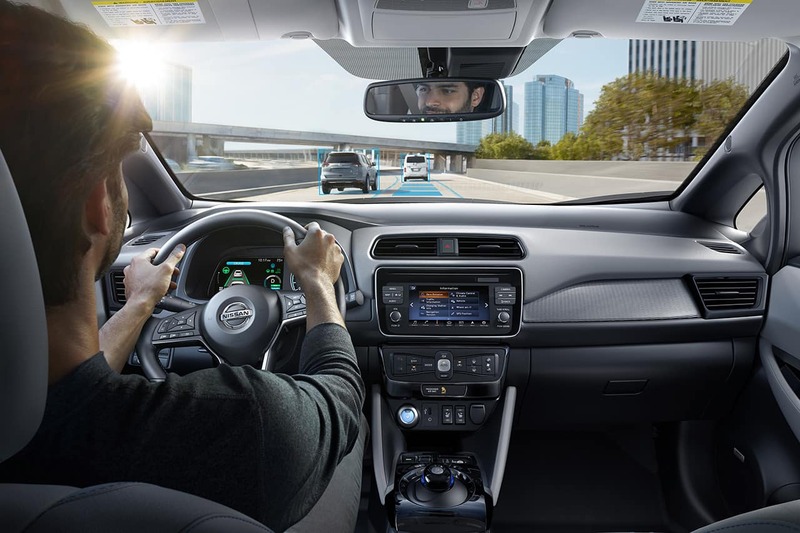 The 2018 Nissan Leaf comes equipped with ProPILOT™ Assist, which makes highway driving easier and less stressful than ever before. It combines intelligent cruise control with steering assistance. With just the touch of a button, ProPILOT™ Assist follows the car in front of drivers and maintains a safe distance, while also keeping the vehicle properly centered in the lane. You can even select a preset distance between cars according to your own comfort and preference. The system also has the ability to come to a complete stop and resume automatically in stop and go traffic–all without any intervention from the driver of the vehicle. The new Leaf comes equipped with NissanConnect Services, Apply CarPlay, and Android Auto. 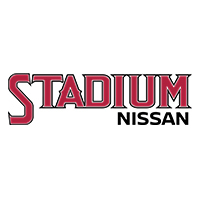 NissanConnect Services includes Remote Lock/Unlock, Speed Alert, Automatic Collision Notification, Emergency Call, and more. There are also new NissanConnect EV smartphone and wearable apps that let drivers do things like control the A/C, begin charging, and plan their route–all from their smartphone before even getting into the vehicle. Apply CarPlay and Android Auto come standard on the SV and SL trim levels. Nissan added the e-Pedal mode to the new Leaf to allow drivers to drive with just one pedal. The e-Pedal mode has been shown to reduce fatigue by utilizing the 2018 Leaf’s regenerative braking to minimize the need to switch between the accelerator and brake pedals. The system can be activated and deactivated with just the push of a button. It can be used at any time for conventional braking, but also has the unique ability to come to a complete stop–and then hold its position–on even steep hills without having to touch the brake pedal. 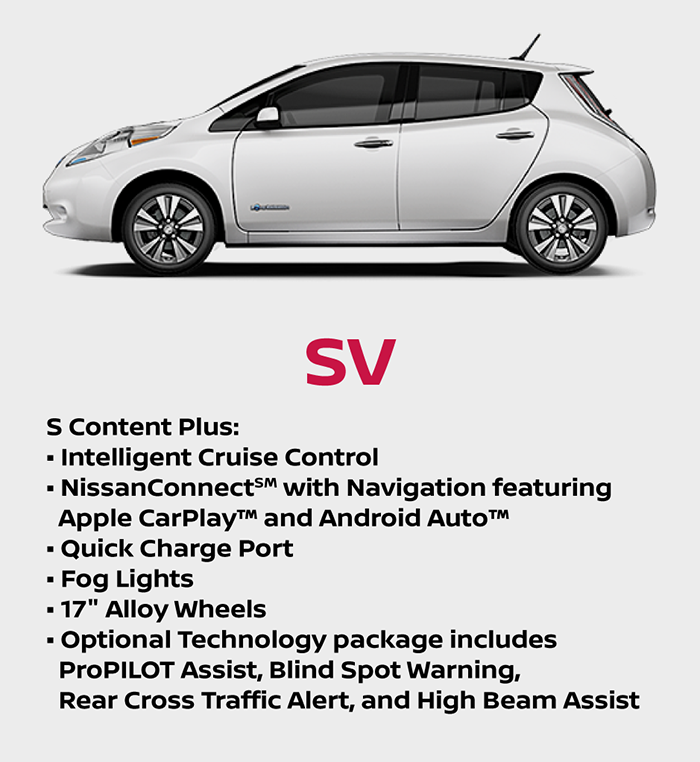 The 2018 Nissan Leaf comes with several new and improved safety technology features. It comes with standard Automatic Emergency Braking system, which uses radar to monitor the vehicle ahead and then can apply the brakes to help avoid a collision or can reduce the speed of impact. The 2018 Leaf also features available Blind Spot Warning, which comes with an indicator that appears in the driver or passengers’ side door when a vehicle is detected in the blind spot area. Another great safety technology that the Leaf includes is Rear Cross Traffic Alert. 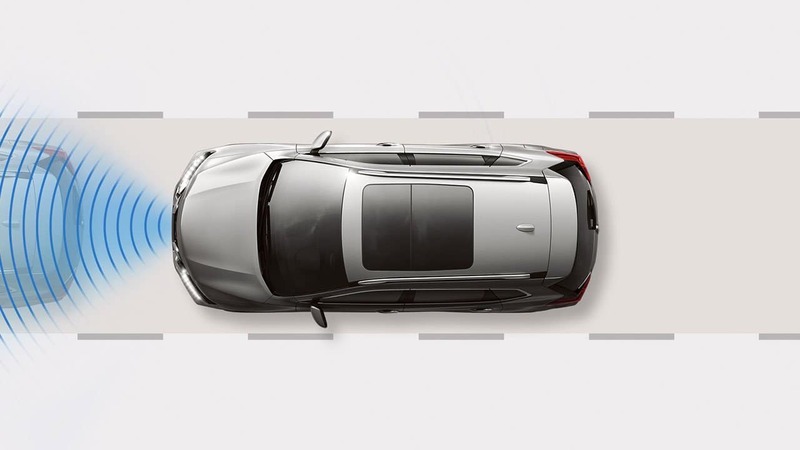 When backing out of a parking space, the Rear Cross Traffic Alert will warn the driver of vehicles that are approaching from the side, to help prevent any sort of collision. 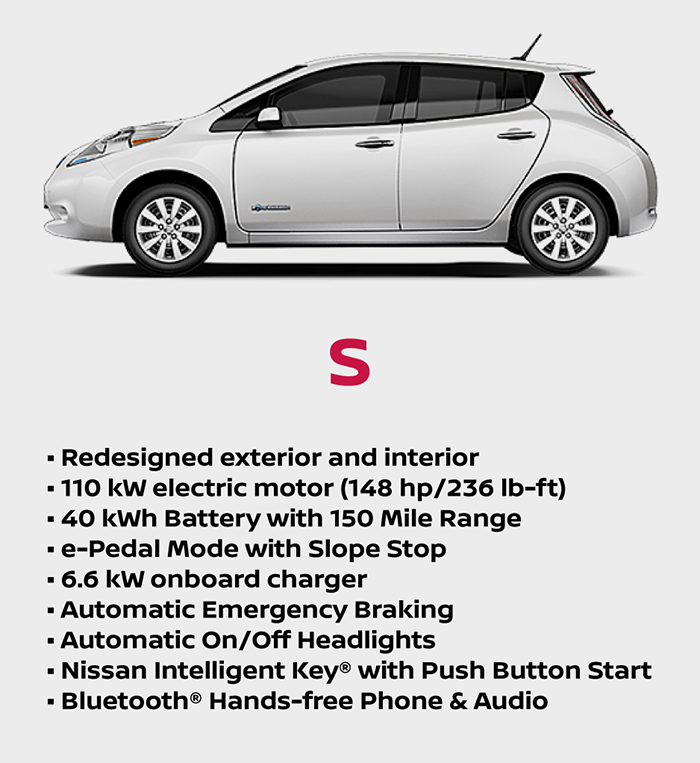 The all-new Nissan Leaf comes at 3 different trim levels: S, SV, and SL. 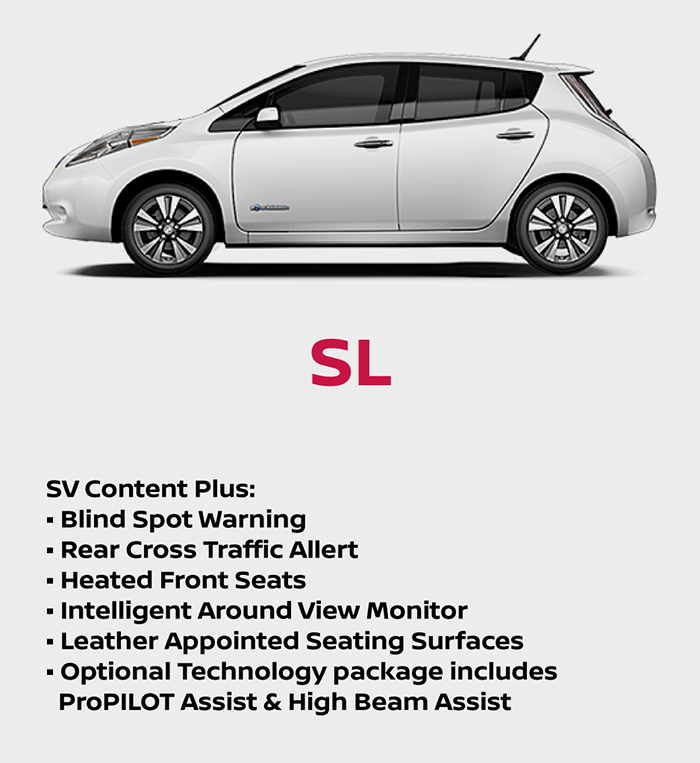 Each trim level comes with different features, many of which are brand new to the Leaf for 2018. Fill out the form below to reserve your LEAF today!